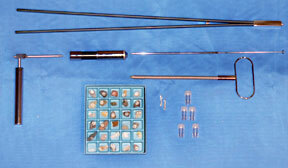 The Finest Dowsing - Divining Rods Available. This special compactly-made locator is designed only to search for gold or silver. 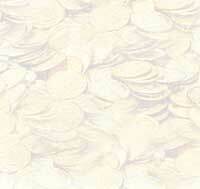 It will not be attracted to any other material than gold or silver. The Titan-II has been a favorite of many treasure hunters because its size is such that it can be carried in your shirt or coat pocket at all times. 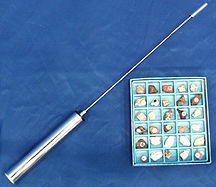 You can use the Universal Depth Rod when you are determining the direction to a treasure or a mineral deposit AND also when determining depth. 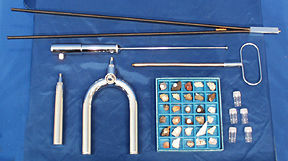 The Universal Antenna Rod is a special instrument designed for the professional treasure hunter or prospector who needs an instrument to search for all types of metals or minerals. In the Precision-Master Rod, a small amount of a radiant energy mineral ore is used to stimulate the crystals in the power tube. Reports from customers on this instrument are enthusiastic and say they get a strong reaction when using it. Our field tests have given very favorable results and we feel that it is a substantial improvement over the Universal Antenna Rod and other competitor's equipment. The PMR-II was developed by building on the same principles used to build the Precision-Master Rod, together with improvements that make this an entirely new instrument.The PMR-II uses in its power tube a powerful combination of mineral crystals, together with a radiant energy stimulant. We believe you will be amazed at the results you get with this all-new instrument. The PMR-II is second only to the top-of-the-line PMR-III. The PMR-III is a new instrument developed by using the power load ingredients of the PMR-II in one tube, together with a newly developed power load formula in a second power tube. User reports as well as our own field test have led us to conclude that the PMR-III is probably the most sensitive and effective dowsing instrument that can be built with currently available technology. 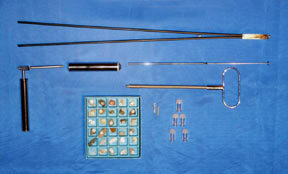 These instruments are unconditionally guaranteed for 10 years. If any service or repair is required during this period, it will be performed free of any charge. 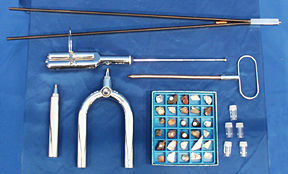 These instruments are sold on a 30-day trial money-back guarantee. If it does not perform exactly as advertised, return it in good condition and your money will be immediately refunded.